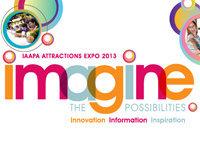 IAAPA Attractions Expo 2013 starts in a few hours at the Orange County Convention Center in Orlando, Florida. The first day will be devoted exclusively to various conferences (including a behind-the-scenes tour of Epcot), the trade show itself does not open until Tuesday at 10:00 and ends on Friday 22 at 16:00. More than 25,000 visitors have already registered, but what will be exhibited here? Let's say there will be many new releases! Namco will unveil Super Alpine Racer, a new version of its popular skiing game playable with up to 8 players and featuring a 55" vertical screen, Mach Storm, an air combat simulator running in a cabinet equipped with a 180° screen 180 (the same cabinet as Mobile Suit Gundam Senjo no Kizuna) and a Theatre version of Dark Escape 4D. This show also marks the U.S. releases of Dead Heat Riders and Mario Kart Arcade GP DX (with Banapassport support). On the same booth, one also finds the latest Raw Thrills products: the Batman racing game, the Aliens Armageddon gun shooting game and the Duck Dynasty update of Big Buck HD. On Sega's side, this will be the launch of the Transformers Human Alliance shooter and of Plants vs. Zombies - The Last Stand video redemption. They will also exhibit the latest racing games from Chinese manufacturer Wahlap: Storm Rider and Storm Racer G. Next to Pump It Up 2013 Fiesta 2 and Pump It Up Infinity in TX (55") and CX (42") cabinets, Andamiro will showcase Hit the Beat, a music game for kids. Injoy Motion will be there with Allied Tank Attack, a tank game for 2 players where one shoots the enemies while the other drives. As for video redemptions, Universal Space will release Frost Island, a shooting game where players shoot at the screen using water guns, Fun Fair Bash which offers several funfair classic games, a 4-player version of its Pirate's Hook fishing game and 4 new games for its 47" Xtreme cabinet. In the same category, visitors will be able to try ICE's Monopoly, Piñata by LAI Games and Rail Rush from Coastal Amusements, the arcade adaptation of the hit game for smartphones. Please find the complete list of all presented video games and information about each of them on our forums. 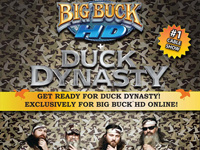 Announced since September, the big update bringing Duck Dynasty content to Big Buck HD was automatically downloaded on November 11 on all machines connected to the Coin Up network. This additional content includes 16 levels of duck hunting and 4 bonus stages inspired by the popular Duck Dynasty American series. Broadcast on A&E, this reality TV show follows the life of the Robertson family in Louisiana, bayou people who became multi-millionaires by manufacturing duck calls and decoys (the Duck Commander brand). This update will transform Big Buck HD into modern Duck Hunt. But that's not all because another recent update added the "Big Buck Arcade" mode, a basic version of the game aimed at one timers who do not want the hassle of unnecessary options. Adam Pratt of Arcade Heroes has just published a video overviewing all these new features. Free updates for arcade games are nothing new (Tekken 5, Initial D 4, Terminator Salvation, ...) but they rarely add so much content! A very welcome initiative! Since several years, the new Konami's beatmania is released during Fall. beatmania IIDX 21 SPADA is the new episode and is out today. The game features two game modes: single play (SP) and double play (DP). The first is played with a turntable and a 7-key keyboard and the second with a turntable and two 7 key keyboards adding a real difficulty. The player can now easily switch from one mode to the other during song select screen. The "Step Up" mode for beginners has been revamped: a kawai character called Kupuro guides the player throughout the world to help him to improve. The game's graphic theme is based on the swords that are found everywhere in the game (menus, backgrounds...). For the first time in years, this is not a female character who appears on the game visuals but this is a young man dressed as a Knight. 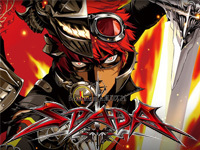 beatmania IIDX 21 SPADA features more than 800 songs. The title song is Element of SPADA by Nekomata Master feat. Haruka Shimotsuki. Among the new titles, you can find: Adularia by DJ TOTTO, Alba -Dawn de SOUND HOLIC feat. Nana Takahashi, DARK LEGACY by BaSTeT, AGIC & LOVE by DJ Genki feat. Yukacco, rainbow guitar weeps by dj TAKA and WOBBLE IMPACT by Sota Fujimori. Like all Konami games, beatmania IIDX 21 SPADA supports the e-AMUSEMENT PASS. 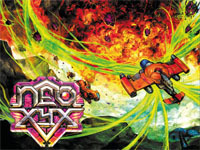 Released on October 28, NEO XYX (pronounce "Neo Zaikusu") is now updated to version 1.1. What's new? Better handling of sprite priority, icons and warning messages announcing bosses are now correctly oriented in horizontal mode, dipswitches management on consolized systems has been improved and several bugs have been fixed. This free update can be obtained on request by sending an e-mail to NG:DEV.TEAM. For those who do not remember this title, it's the first Neo Geo MVS shoot'em up that can be play both vertically and horizontally depending on the orientation of the cabinet's monitor. The game features 6 stages, 6 bosses and 5 mid-bosses. Like all NG:DEV.TEAM productions, this danmaku benefits of beautiful 16-bit graphics pixel art graphics. If you missed the MVS version that was only available in pre-order, you can catch up with the Neo Geo AES version (€449) or the Dreamcast adaptation (€34) that should be available before Christmas. Announced since March, Puyo Puyo Quest Arcade is out in Japan yesterday. Sega renews the Puyo Puyo license with this new game: a mix of puzzle and RPG. 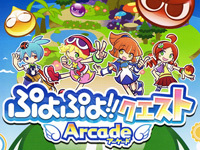 Puyo Puyo Quest Arcade is the first arcade game to be free... In fact, only starting the game will be free. The free to play concept is simple: a "Genki" gauge is consumed during the game and the player must pay to fill it again. During the fight the screen is divided vertically: on the left, the RPG part with the combat between players and the monster and on the right side, the classic puzzle game. The whole game is playable via a touch screen. It is important to prepare chain reactions to inflict greater damage to enemies. There are a lot of characters from the Puyo Puyo world such as Arle Nadja, Amitie and Andou Ringo and there are many quests. Puyo Puyo Quest Arcade is playable online up to 4 via the ALL.Net network and supports the Aimé card. The game is also compatible with Puyo Puyo Quest, the iOS version for mobile phones. Attention all street racers! 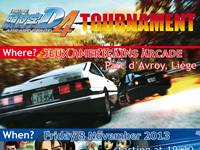 Tomorrow, save your evening for the Initial D 4 tournament! After Sega Rally 2 in 2006 and Terminator Salvation in 2011, now is the time for our third Winter competition at Liège funfair. 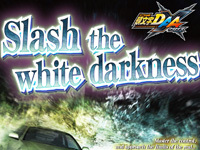 This year, the Initial D 4 racing game is highlighted with a tournament on the only machines in the country! As usual, it's a single elimination tournament. In the first round, pairs of players are randomly selected to compete against each other. If you lose your first race, stay there as you can possibly be called back for the second round. Participation is €5 and there are many prizes to win: video games (given by the Player shop in Chênée), DVDs, T-shirts, soft toys and goodies. Don't worry if you're not a good driver, the atmosphere is great and all participants will leave with candies. The complete rules are available on the forum and on Facebook. To summarize: it's version 1.5 of the game, the tracks will be planned, starting with the simplest (Lake Akina or Myogi depending on the number of entrants) and ending with the final in Tsukuba. All races are downhill. The weather conditions are randomly drawn before each race (dry/rain and day/night). The use of IC cards is of course allowed. Let's meet tomorrow (Friday) at 19:30 at Jeux Américains arcade in the Parc d'Avroy in Liège. The nearest train station is Liège-Guillemins. Registration is done on site and remains open throughout the duration of the first round, so do not worry if you're a little late. While waiting for your turn, there will be other video games (Time Crisis II, Rambo, Terminator Salvation, Sega Rally 2 and Manx TT), cranes, bulldozers and redemption machines for your enjoyment. See you tomorrow! 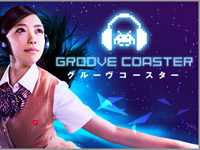 Groove Coaster is a rhythm game from Taito that is released on Type X Zero today. Originally, it was a game out on iPhone and iPod in June 2011 in which the player uses the touch screen to play. The arcade version and a little different as the player uses two spherical controllers each surmounted by a large button. The goal is to perform various actions on the music rhythm to finish a level. Depending on the symbols appearing on the screen, the player must top on the button, hold it pressed, slide the controller left or right,... Generally, only one controller is used but sometimes both are used at the same time. The game has very beautiful vector graphics. The playlist currently contains 21 songs written by artists such as Cosio and Shohei Tsuchiya from Zuntata, Sampling Masters MEGA, M.S.S. Project, Another Infinity, ChouCho, CTO LAB., CTS,... Groove Coaster uses NESiCA network and saving card. 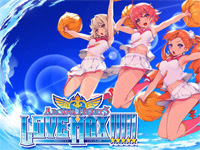 Arcana Heart 3 LOVE MAX! 1.05 is released today (one day after the date initially announced). This is not a major update this time but some bugs from the version 1.04 out on October 3 have been fixed. The choice of color is now available for all characters and many new titles and backgrounds have been added in "Training" mode. 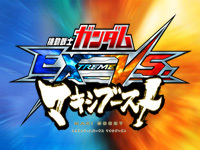 The next game from the Extreme VS. series is subtitled Maxi Boost and will be released in March 2014. More than 110 units are already announced, some of which will have to be unlocked. Mechas from Full Boost will benefit some attack tweaks and new movement animation. Some new Gundam are already known: MS-06F Zaku II (Mobile Suit Gundam), MSM-07S Z'Gok (Mobile Suit Gundam), ZGMF-X666S Legend Gundam (Mobile Suit Gundam SEED Destiny), GAT-X105 Strike Gundam (Mobile Suit Gundam SEED/SEED Destiny), RX-104FF Penelope (Mobile Suit Gundam: Hathawayâ€™s Flash), GN-001/hs-A01 Gundam Avalanche Exia (Mobile Suit Gundam 00), GNX-903VW Brave (Mobile Suit Gundam 00), First Gundam/RX-78-2/G-Armor (Mobile Suit Gundam), AGE-1 Gundam (Gundam AGE), Black Qubeley (Mobile Suit Zeta Gundam/Gundam ZZ) and the GAT-X105B Build Strike Gundam (unlockable, Gundam Build Fighters). New stages will also be added and the CPU Battle Mode will be improved. Regarding the gamaplay, NamcoNamco chose to return to original Extreme VS. gameplay: there is only one kind of Extreme Burst (against two in Full Boost). A new type of Awakening mode, the EX Overdrive, which triggers when certain conditions are met, will be added. The EX Overdrive is available in 2 modes: F-Drive that uses melee attacks and S-Drive that uses projectiles. Rumors say it will run on the rumored Sytem 478 from Namco.